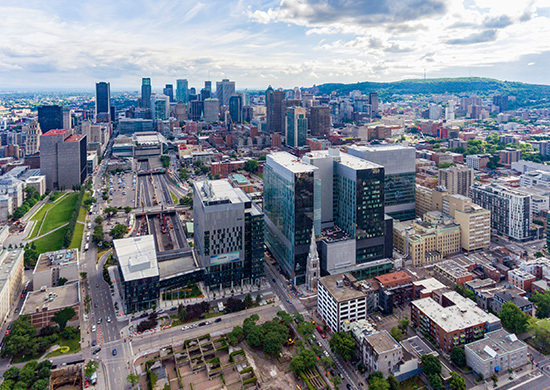 For more than seven years, CannonDesign + NEUF architect(e)s has been engaged in the design and construction of the Centre hospitalier de l’Université de Montréal (CHUM) – the largest healthcare project being built in North America. Spanning two full city blocks and rising 21 stories tall, it’s easy to get captivated by the sheer enormity of the building. But as the designers responsible for drawing every line and planning every space within the 3.5 million SF structure, we’re most proud of the art and craft that went into each detail. Over the last few years, we’ve been working with filmmaker Karine Savard and designer Annabelle Beauchamp to capture some of these details unfolding. The result is a series of short films that capture the essence of what makes CHUM special – from the illuminated passageway floating above Sanguinet Street, to the preservation of the Saint-Sauveur steeple, the construction of the grand atrium spaces, and the artistry that went into creating the rooftop terraces along with NIP Paysage. Below is one of the videos.